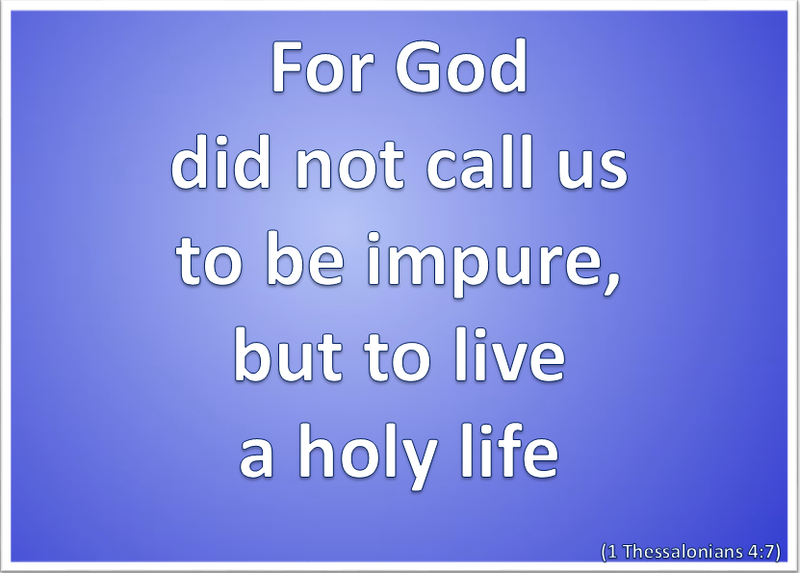 Holiness means that we are set apart for God, and not for ourselves or the world – we are God’s people, called to live His way, His truth and His life. In terms of the Old Covenant holiness was a requirement for salvation and to remain as God’s chosen people – which the people demonstrated that they were completely unable to live out. In terms of the New Covenant holiness is seen as a consequence of our salvation and our new standing as the adopted daughters and sons of God. It reflects what God has already done for us and in us and is evidence of the Holy Spirit living within us – for it is He who produces this fruit. We allow Him to do so by surrendering ourselves to Him, recognising what it is that He is wanting to do in our lives and co-operating with Him. We already know what this is because we have seen something of it in the character of God, the example of the Lord Jesus and the guidance of the Holy Spirit. Holiness then is living as the daughters and sons of God in the power of the Holy Spirit whilst still in the midst of a fallen world. 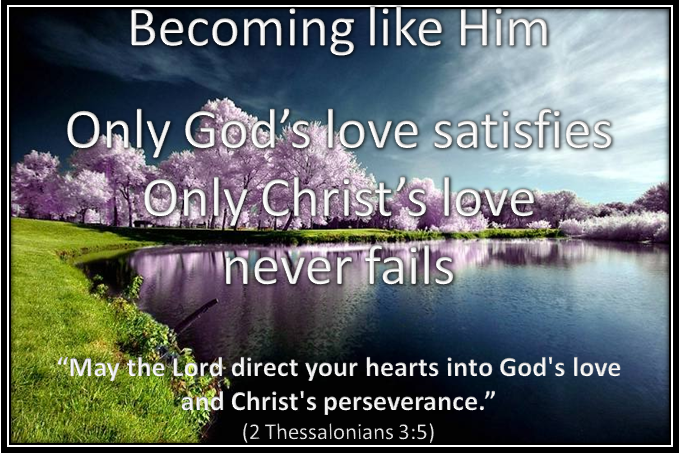 There will be many a struggle before we relinquish some of our ingrained habits and desires – but the Holy Spirit will never give in because He will give effect to God’s desire and purpose for us. The sooner the better, for we will then experience more of the fullness of the life that He has for us and experience more of the reality of His great love. ‘Most High and Holy God, enthroned in fire and light, burn away the dross of our lives and kindle in us the fire of Your love, that our lives may reveal the light and life and love we find in Your Son, our Lord Jesus Christ.’ Amen. Categories: Christianity, Daily Life, God | Tags: Daily Bread, Faith, Holy Spirit, Jesus, Life, Priorities, Scripture, Thessalonians | Permalink. Categories: Christianity, Daily Life, God | Tags: Daily Bread, Faith, Grace, Holy Spirit, Jesus, Life, Love, Scripture, Thessalonians | Permalink. Categories: Christianity, Daily Life, God | Tags: Daily Bread, Encouragement, Holy Spirit, Jesus, Perseverance, Priorities, Scripture, Thessalonians, Truth | Permalink. Paul had no doubt that God was not a disinterested spectator in the affairs of the world, of His Church and of His people individually. His learning and his experience taught him otherwise. His encounter with the living Jesus, his experience of the Holy Spirit and the way God opened his eyes to the Scriptures convinced him of God’s presence, purpose and commitment. He lived his life accordingly. 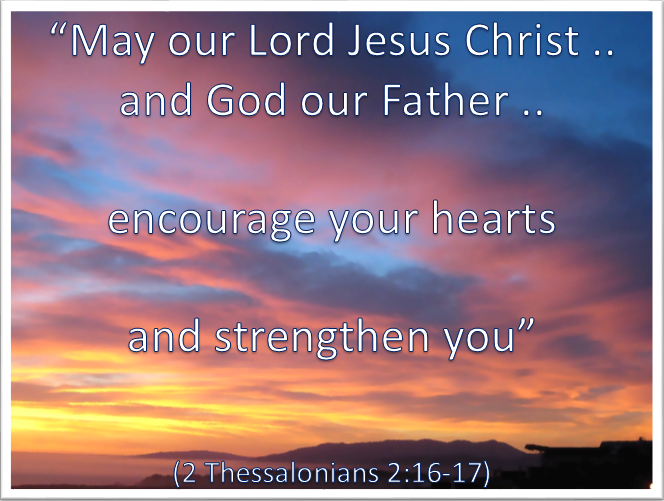 Paul’s prayer request here is an acknowledgement of the personal presence and involvement of God. He does not prayer that messengers will be sent to us but that God Himself will reach into our lives to encourage and strengthen us. His own experience would have been of the truth of such blessing by God and of its value and importance. Christian life and ministry can, at times, be very lonely and insecure. We may wonder where God is and if what we are about has any significance or value in the greater scale of things. We may even become confused by what appears to be contradictory teaching by different churches, by different ministers within the same denomination, and even by the ridicule levelled at Christianity by others. We need to remember that Jesus gave His life, and His ongoing commitment, to the people who would believe in Him and continue His work and ministry. Every aspect of it, whether thought, word or deed is of importance and, if of God, contributes towards the building and extension of His Kingdom. Each one of us does indeed have a Circle of Influence, far wider in today’s world than we would at first imagine. If God desires something to happen, whether on an international or personal front, then He will support and empower it. If God wishes you or me to lead a particular type of life – a holy life – then He will support, empower and encourage it. 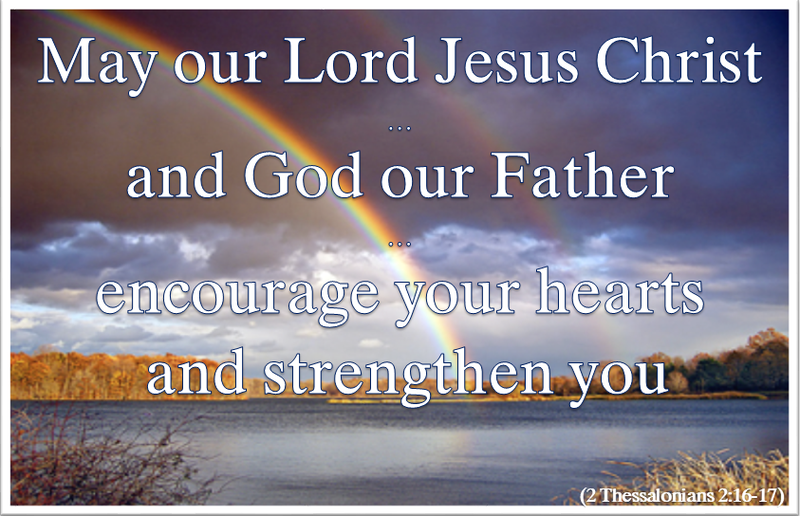 He will also stand with us when the enemy attacks us and attempts to scare us into inactivity or lead us astray. We may ask and receive – and step out in that confidence. Remind yourself of Jesus promise to be with you always, and act accordingly. 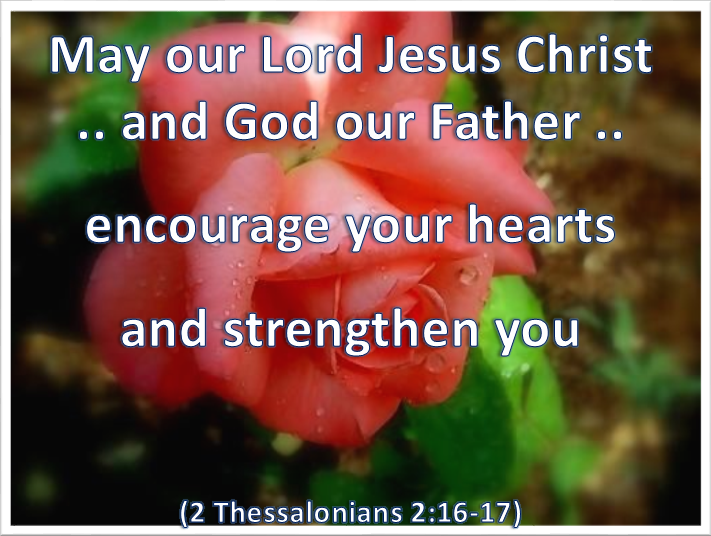 Categories: Christianity, Daily Life, God | Tags: Daily Bread, Encouragment, Faith, Holy Spirit, Jesus, Life, Love, Prayer, Scripture, Thessalonians | Permalink. Only God’s love is total and seeks only what is good for us and for all those around us. Only God’s love is completely forgiving and takes into account not only what we say and do but what is in our hearts and lives as well. Only God’s love is completely accepting and understanding as we battle our way through life with Him. Only God’s love is fully sacrificial and looks to cleanse us of guilt and sin so that we might begin to be the person of our true potential. Only God’s love has an eternal perspective and plan for us. Only God’s love includes the gift of His Spirit – to guide, teach equip and empower us, and to bring us into our true and eternal relationship with God as His sons and daughters. Only God is Love. There is around us a constant flood of temptation or urgent appeals to attract us into involvement or expenditure that can never satisfy the need or craving within us. They focus on our desires and inadequacies but can never deliver. Only God calls us – not to use His product, but to come to Him. Advertised products are impersonal. Jesus is very personal. He wants to come into our lives and make a love difference there – not so that we will just look better on the outside, but that the healing and restoration on the inside will produce a glow on the outside that tells of a life that has changed. Pray every day for God to lead you deeper into His love. Read the Gospels and live what Christ teaches. Decide to put your trust in Him. Heavenly Father, You are love and Your Spirit pours Your love into our hearts. Please pour Your love into my heart and help me to draw closer to You, and to become more aware of, and trust in, Your great love for me. In Jesus Name…Amen. Categories: Christianity, Daily Life | Tags: Bible, Daily Bread, Daily Word, Direction, Faith, god, Lord, Obedience, Scripture, Thessalonians, Trust, Way | Permalink.